King Of The Jungle is a great baby boy gift basket to send the new parents to celebrate the arrival of the new addition to the family. Free Toronto hand delivery.One of our great selections of baby gift hampers baby gift baskets filled with newborn products to welcome new baby boy to the world. 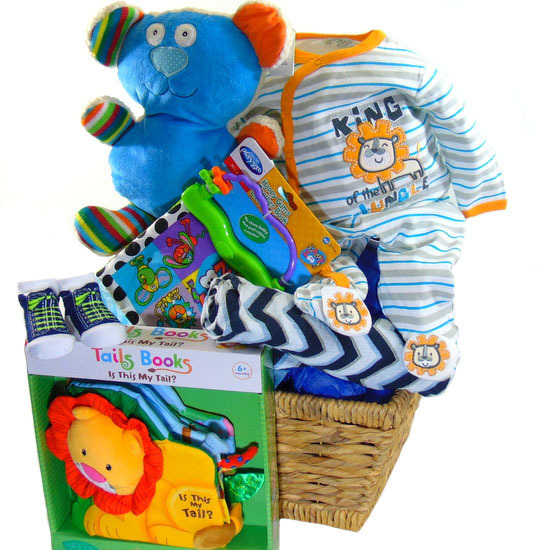 King Of The Jungle is a great newborn boy gift basket. Send the new parents ans celebrate the arrival of the new addition to the family. Free Toronto hand delivery. One of our great selections of baby gift hampers. 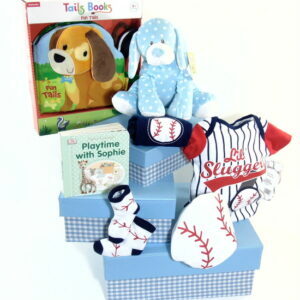 Baby gift baskets filled with newborn products to welcome new baby boy to the world. Jungle Baby basket boy wicker braided basket with side handles great for storing baby toys, King of the jungle embroidered baby sleeper with lion embroidered booties, Blue cotton muslin baby blanket, Baby Ganz blue sugar & stripes bear stuffed animal, Playgro Happy Gums Teether book, Blue baby socks, Lion fabric Kidsbooks tails book.